249 Nov. 1946 W. C. T. U. WILL HAVE POT LUCK SUPPER The W. C. T. U. will meet with Mrs. Mary Swain for a supper meeting at 6:30 o'clock on Wednesday evening, October 16th. The members are asked to bring their families, a pot luck lunch, and table service; also notice the change of date from Tuesday to Wednesday evening. The new president, Mrs. Hicks, will have charge of the program and Mr. Hicks will lead the devotions. The WCTU met at the home of Rev. 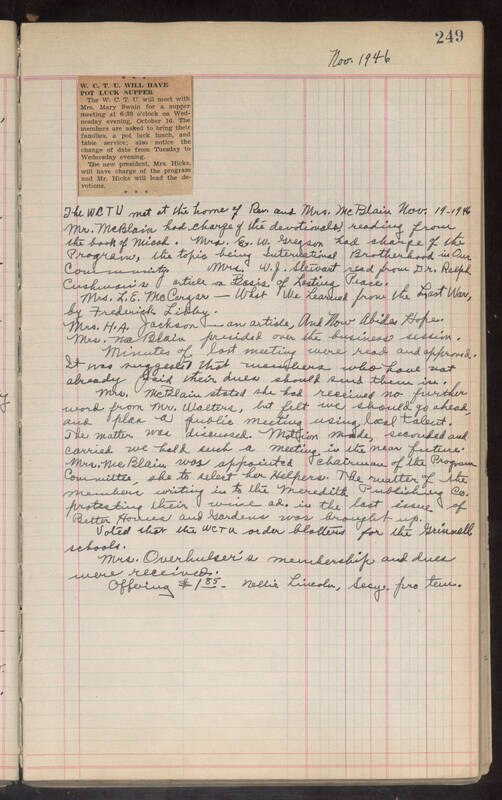 and Mrs. McBlain Nov. 19, 1946 Mr. McBlain had charge of the devotionals, reading from the book of Micah. Mrs. E. W. Gregson had charge of the Program, the topic being International Brotherhood in Our Community. Mrs. W. J. Stewart read from Dr. Ralph Cushman's article on Basis of Lasting Peace. Mrs. L. E. McCargar - What We Learned from the Last War by Frederick Libby. Mrs. H. A. Jackson - an article, And Now Abides Hope. Mrs. McBlain presided over the business session. Minutes of last meeting were read and approved. It was suggested that members who have not already paid their dues should send them in. Mrs. McBlain stated she had received no further word from Mr. Walters, but felt we should go ahead, and plan a public meeting using local talent. The matter was discussed. Motion made, seconded and carried we held such a meeting in the near future. Mrs. McBlain was appointed chairman of the Program Committee, she to select her Helpers. The matter of the members writing in to the Meredith Publishing Co. protecting their wine ad. in the last issue of Better Homes and Gardens was brought up. Voted that the WCTU order blotters for the Grinnell schools. Mrs. Overhulser's membership and dues were received. Offering $1.85. Nellie Lincoln, Secy. pro tem.